C.F. Murphy Associates with Perkins & Will Associates, Architects and Engineers. Gust K. Newberg Construction Company, Contractor. First National Bank of Chicago, Developer. BankOne, Current Owner. Spanning an entire city block at the center of Chicago's Loop, One First National Plaza is most recognizable for its sloping form. 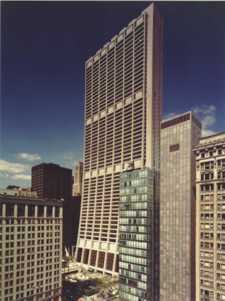 The building's inward-sweeping curve recedes over 100 feet from bottom to top, allowing for a generous 200-foot footprint at street level to accommodate large open banking spaces dictated by Illinois' unique consolidated branch policy. The tower's broad base not only satisfies program requirements, it also provides effective wind resistance. Stiffness is further enhanced by the transfer of floor loads to the steel exterior columns which are clearly expressed in the building's form. Although its central location and distinctive form have helped make this gray-granite ribbed tower a prominent landmark, First National Plaza is perhaps best known for its vibrant public space. Completed in 1972, this multi-level plaza covers half a city block and features the monumental ceramic wall mural by Marc Chagall, Four Seasons. The mural was designed as a gift to the people of Chicago, and the plaza has become one of the most widely used in the city. More impressive facts: Over 20,000 Pearl Gray granite slabs were used in the building's cladding, weighing a total of 35 million pounds. The building also contains more than 20,000 tons of steel, 10,000 tons of air-conditioning capacity, and 30,000 miles of wiring. Photo courtesy of Perkins & Will.